The Crossings returns with 3 pop-up events this month. Jun. 01, 2018, 5:20 a.m. The Crossings event in Wilkinsburg will be 4 to 6 p.m. Wednesday, July 25 starting at 1001 Wood Street. The event, originally scheduled for June 22, was postponed in light of the shooting of Antwon Rose. Q: What do you get when you mix a parade with a flash mob with a demonstration you can join on the spot? A: The Crossings — part performance and part advocacy event centered on improving crosswalks. Participants take to the streets with signs and t-shirts with slogans like “safer together” and “Drive like your Nonna is crossing here.” Blaring James Brown and other music, they dance as they cross the street — legally, of course — while waving to drivers and asking passersby to join in. After one event in 2016 and two last year, including one that resulted in crosswalk changes, The Crossing will return for three iterations this month starting Saturday in Millvale. Join Age-Friendly Greater Pittsburgh. 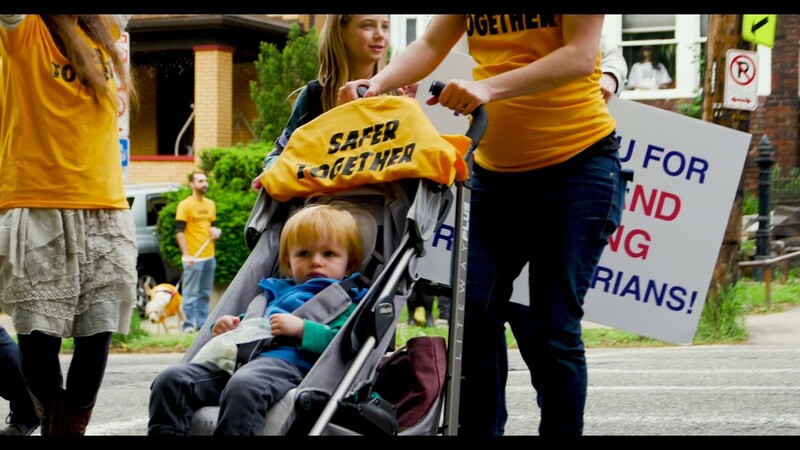 Lively Pittsburgh, the Millvale Community Library, and the Millvale Bike-Ped Committee for this pop-up event to to advocate for safer streets. Anyone is free to join, and don't forget your dancing shoes. When: June 2, 2018 at 3:00 p.m.
Funding for the three events came from the Pennsylvania Developmental Disabilities Council and the Mary Hillman Jennings Foundation. The Crossings was started by Anne Basting, a theater professor at University of Wisconsin-Milwaukee. In 2015, she spoke in Pittsburgh and the now-local organizers immediately loved the idea. It’s a way to “stage events that are a good time and elicit empathy,” said Ted Cmarada, director of community engagement at Lively Pittsburgh, which focuses on engaging and building healthy communities. The group took charge, partnering with Age-Friendly Greater Pittsburgh, an initiative of the Southwestern Pennsylvania Partnership for Aging that made the events its first action item in its 2017-2020 action plan. In some ways, Cmarada said The Crossings is “a very ambitious undertaking,” because it’s about changing an auto-centric culture. The first Crossings event was in November 2016 in East Liberty. After that, there were two more in 2017 — in Lawrenceville that May and Bloomfield in October. In Lawrenceville, participants gathered at 40th and Penn, outside of York Commons, an affordable high rise for older adults. Residents there were scared to cross the street — some had had their feet run over and others, in wheelchairs, were victims of hit and runs, Poskin said. She said one resident pulled her aside and said that she’d lived there for more than five years and never crossed the street. “That’s why we’re doing this,” Poskin told her, and they crossed together. The Crossings organizers later met with Karina Ricks, director of the city’s Office of Mobility and Infrastructure. They worked together to make changes at the intersection, including a longer yellow light to cross the street, “no turn on red” signs and a leading pedestrian signal, which gives people on foot a head-start to cross. “This is just the beginning,” Poskin said, adding that the changes are not only for the residents of York Commons, but for people going to and from the nearby schools, park and library. This year is the first time the events will be outside of the city, and Poskin wants to see the gatherings continue to extend further into the county. It brings together people who belong to different groups, but can all agree on advocating for safer streets, she said. To select locations for The Crossings in 2018, Lively Pittsburgh put out a call to communities asking them to participate in a walkability study, Cmarada said. Residents in Millvale, Beechview and Wilkinsburg applied, and Lively went to the communities to train them to map the streets and sidewalks using the Pittsburgh-made app, pathVu, Cmarada said. The app creates a map of the community and intersections for The Crossings were selected using that data. Wilkinsburg’s Mayor Marita Garrett told The Incline via email that the selected intersection is a four-way stop in a school zone with signage and flashing lights. A driver recently hit a crossing guard there, but she said that was an isolated incident. Communities can also use pathVu data to advocate for street improvements, Cmarada said. That’s one of the things that makes The Crossings an agent for grassroots change. He hopes the event will encourage residents to continue to organize and advocate for changes that lead to healthy communities and bring generations together. It all comes back to people participating in their communities and being able to live well for their whole lives, Poskin said. The Crossings is a celebratory way to advocate for that. “It’s incredible that we are able to live well into our 90s and to 100, but can you be included in your community?” she said.